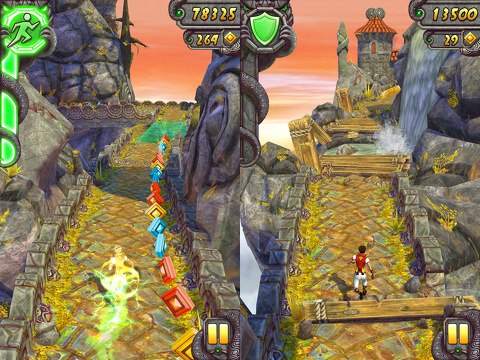 The Temple Run 2 iPhone, iPod Touch, and iPad app is an exciting game where you guide your runner through an obstacle course, earn power-ups and abilities with your accurate gesture controls, and save a precious idol in the process. The graphics are an intriguing mix of Indiana Jones meets the Mayans, and the gesture controls’ simplicity fool you into believing the game will be easy to beat. The Temple Run 2 iPhone app has an excellent tutorial process to get you started. The home screen has an ancient temple graphic and text that encourages you to to grab the idol and run. To introduce you to the gesture controls, the directions appear briefly on the screen. Then, you have a chance to try them out on the actual course. You will appreciate the ability to experiment with each gesture control and get the hang of it within the game’s interface. You use vertical and horizontal swipes intuitively. To jump, you swipe up. To slide under an obstacle, you swipe down. To turn left, you swipe to the left horizontally. A right turn requires a right horizontal swipe. You tilt your iPhone in the appropriate direction to grab coins and power-ups. You double tap to use a power-up. 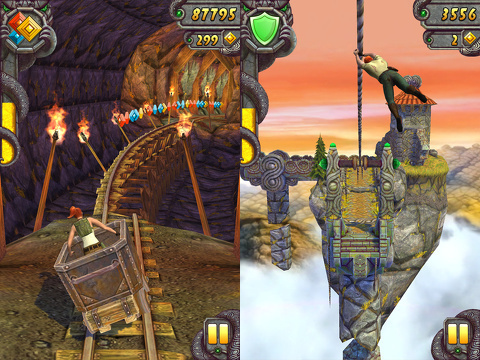 The gamescape of the Temple Run 2 game is filled with details and challenges. You are running from a monster, so the perspective is just behind your character. When the monster creeps up, you’ll see it just behind you. This perspective also gives you just enough time to use the appropriate gesture. The gesture controls are extremely accurate. For example, as you approach a turn, you have to swipe exactly to the left or right. If you try to make the turn with your character by swiping vertically just a bit then to the right, you will jump and miss the turn. The fast-paced nature of the game makes you want to use gesture controls that simply will not create successful results. The ability to be calm, show restraint, and be accurate is the key to winning this game. Appropriate timing and perfection in gesture controls are necessities, as you encounter bridges, ziplines, waterfalls, ruins, and wheels with spikes. You may need to tilt, swipe up, and swipe to the right in just a couple of seconds to grab coins, gems, and power-ups. You can earn points quickly. As you earn points, you can change characters. You can also earn abilities and power-ups to double your coins, boost your speed, spawn, and protect yourself. You can also make an in-app purchase to select from different abilities and power-ups ranging in price from $.99 to $19.99. Both addictive and exciting, the Temple Run 2 iPhone, iPod Touch, and iPad app is a great choice, and the free price makes it a no-brainer for those who like to earn rewards instead of purchase them. AppSafari review of Temple Run 2 was written by Jenni Ward on January 22nd, 2013 and categorized under Action, Adventure, App Store, Free, Fun, Games, iPad apps, Physics Based, Universal. Page viewed 6384 times, 2 so far today. Need help on using these apps? Please read the Help Page. I liked another app better one, Bubble struggle, which I found recently on App store.